Patriots Coach Bill Belichick Denies Knowledge Of Deflated Footballs : The Two-Way His comments come amid reports that 11 of 12 footballs used by the New England Patriots in the AFC championship game were underinflated — an apparent advantage. The NFL is investigating the matter. New England Patriots head coach Bill Belichick, seen here on Jan. 18, says he "had no knowledge" about the controversy over deflated footballs "until Monday morning." New England Patriots head coach Bill Belichick says he had "no knowledge" about the controversy surrounding his team and deflated footballs. "In my entire coaching career, I have never talked to any player or staff member about football air pressure," he said in an opening statement at a news conference today. 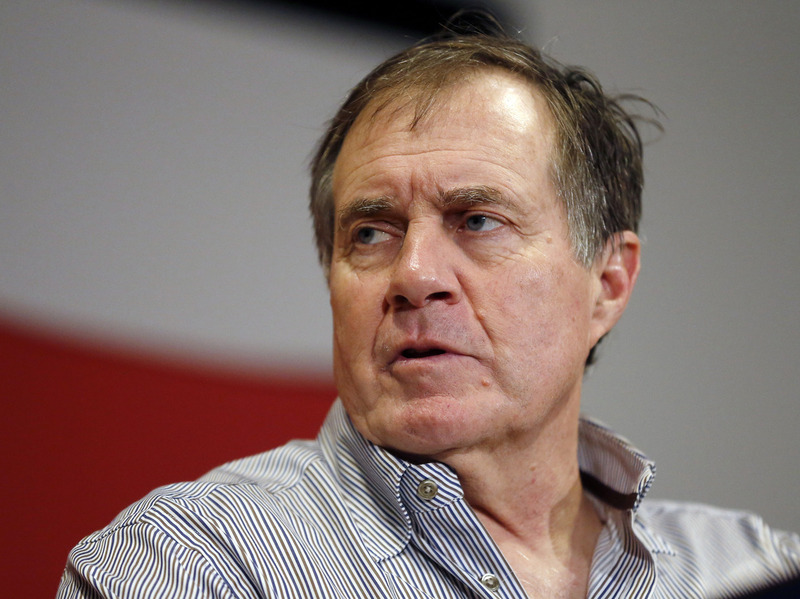 Belichick added that he had "no knowledge of this situation until Monday morning." That was the morning after the Patriots defeated the Indianapolis Colts, 45-7. Soon after that win, Bob Kravitz of Indiana's WTHR TV tweeted: "A league source tells me the NFL is investigating the possibility the Patriots deflated footballs Sunday night." Two days later, ESPN quoted anonymous sources within the NFL saying 11 of the Patriots' 12 footballs in the AFC championship game were underinflated by 2 pounds per square inch. Troy Vincent, the NFL's executive vice president for football operations, told The Associated Press the league was awaiting the findings of an investigation. "Under NFL rules, the home team supplies most of the balls used in games; the visiting team brings footballs for its own offense to use. All the footballs must be inflated within a range of 12.5-13.5 pounds per square inch and weigh between 14 and 15 ounces. "In wet and slippery conditions, an under-inflated ball could be easier to grip and catch. And in last night's game, an NFL official reportedly took at least one ball out of circulation after suspecting it didn't meet league requirements." Does any of this matter? NPR's Geoff Brumfiel reported that the answer to that question is yes. The controversy has been dubbed "Ballgate" or "Deflategate," which NPR's Chappell pointed out echoes "the infamous 'Spygate' episode of 2007, when the Patriots and coach Bill Belichick were found to have videotaped the New York Jets' signals. "The spying incident resulted in the NFL stripping the Patriots of a first-round draft pick and fining Belichick," Bill reported. The Patriots will face the Seattle Seahawks in the Super Bowl on Feb. 1.